My version of Jamie Oliver's Beef Wellington. You can get his excellent book and see that he puts the peas inside and does not add the mushrooms. You can easily modify this recipe to your family's tastes. 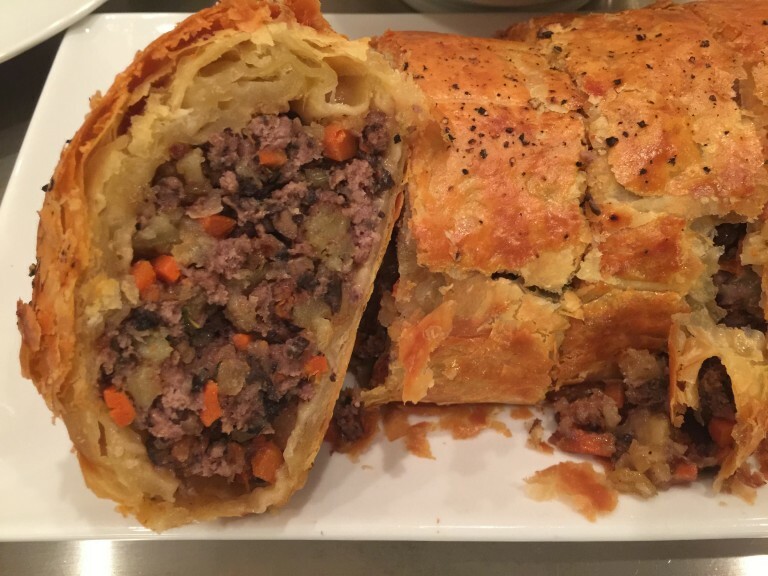 Follow me along making it at these posts: Beef Wellington Filling, Assembly and Finish. 2 to 3 Portobello shrooms... You GOT IT... finely diced!!! Leave to one side to go cold. Gently mix in the raw beef. Season generously with salt and pepper! Once the pastry has defrosted roll it out slightly on a lightly floured surface! Split the filling between the 2 sheets of pastry! Brush with beaten egg and pepper the top. Place on a baking tray lined with tin foil and parchment paper. should be golden and HOT all the way through!